Contains 50 Spirit-led devotionals showing you how to fulfill your God-given purpose and potential; how to revive your relationships and marriage; how to deal with temptation, addictions, or joblessness; how to believe God for miracles; and how to receive God’s provision in times of adversity. To order a signed copy of this new Men’s book with a credit card or PayPal (if you are in the U.S.), please use the Buy Now button below. If you would like your book personalized for yourself or someone else, please specify that in the instructions area as you check out. Orders are shipped out promptly by First-Class Mail and will arrive in 2-5 days. You can also purchase this new Men’s book on ETSY, along with the entire Promise-Powered Life devotional book series. To browse the new J. M. Farro ETSY Shop, please Click Here! 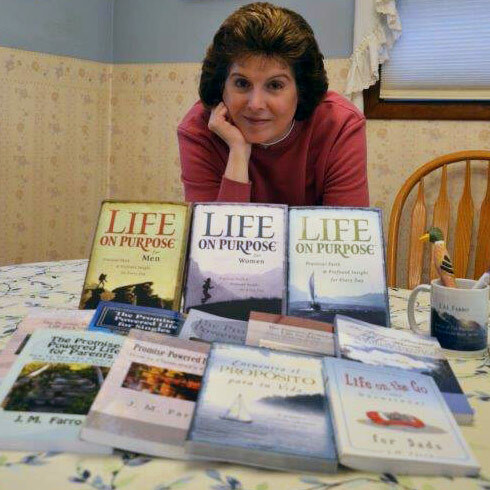 For any book-related questions or inquiries, please contact Joanne directly at JMF@JMFARRO.COM . Thank you!